Spanish Eyes is a video slot game from NextGen Gaming that is set somewhere in an idyllic village where our Morena can dance flamenco and seduce us with her shouldering eyes. The design of the game is quite simple where the reels take the whole screen and there is not enough room for a background. There are some nice animations and the sound effects complement the theme. There are a couple of features in Spanish Eyes that are worth the mention. First we have the wild symbol, which is the dancing girl and its function is to substitute for every other symbol except for the scatter to complete a winning line. If you manage to land the wild symbol on the first and the fifth reel then you will activate a mini game. You just need to pick one of the girls to reveal a cash prize. 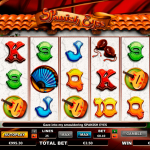 The red rose is the scatter and if you manage to land 3 or more you will activate the main feature, the free spins round. 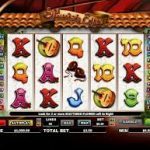 You will receive 12 free spins and all the wins will be a subject to x3. It is also possible to re-trigger the feature if you land 3 or more scatters again, and you can also activate the Spanish Girl bonus from here. Spanish Eyes is a very entertaining and festive game from NextGen Gaming. We really enjoyed playing this game and we believe you will too. The design of the game is nice and the game play is smooth. There are a couple of features that are easy to activate and they will improve your balance in no time. The betting options are made in that way that they will suit every player’s need too. 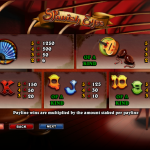 For another great engaging game you should consider playing Shangri La a 5 reel slot by NextGen.